Durable CD Player that features front loading CD Player, LED Display (shows track number), play/pause button, volume control, headphones jack, DC 6V jack included (adaptor is not included). Also available in pink. 6 x C batteries required…. This toy costs approximately £24.99 (for the latest and best prices make sure you check our retailer list for the Sing Along CD Player Pink above). 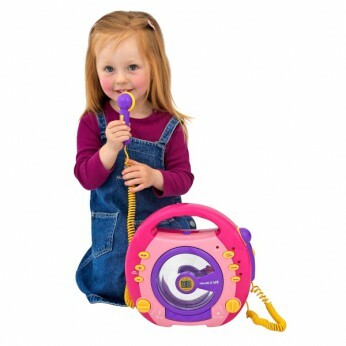 In our review of Sing Along CD Player Pink we classed it as being suitable for ages 1 to 3 years, 3 years, 4 years but recommend you check the manufacturer specific advice before purchasing.